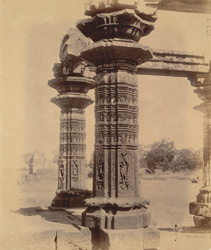 Photograph of a close view of the pillars of the mandapa at the Ayeshvara Temple at Sinnar taken by Henry Cousens in the 1880s-90s. Sinnar is located in Maharashtra, twenty miles south of Nasik. The town is home to a number of temples, most of which were built between the eighth and eleventh centuries like that shown in this photograph. In the Bombay List of 1897 Henry Cousens wrote, ''The shrine of Aesvara upon the north-west of the town...is the remains of a Chalukyan temple. It consists now of the shrine, but with part of the first storey of the shikara, and eight columns standing out before it in two groups of four each, one behind the other. These pillars are polygonal in plan...four being eight-sided and four six-sided with recessed corners....Altogether this temple has been a perfect gem, rich in the very best workmanship, the bas-reliefs being exceedingly well carved.'' This is a view of two of the eight-sided mandapa columns located in front of the temple entrance. The pillars are decorated with sharply cut mouldings and panels with small figures of divinities.